The short video piece was shot in the forests surrounding Berlin, composed by a thinly woven narrative thread, the video depicts an unlikely forest ranger in the course of her enigmatic duties. 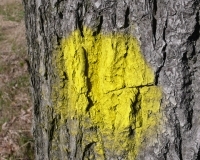 One sees views of an ordinary springtime forest with colorimetric variations that border upon the abstraction. The piece begins with the mise en scène a possibly futuristic fairy tale and ends with the viewer face to face with the systematically categorizing of the forest flora. 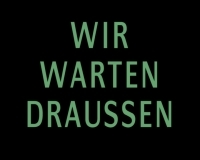 One goes from a potential Grimm Brothers setting to a montage of data registration within wilderness zones.The central slogan «Wir warten draussen» (We are waiting outside), which is normally used to forbid the access to animal sanctuaries, appears as a condition of things, questioning the perspective of the players involved. This subtle juxtaposition arrives after one comes to grip with the glade-central place between the wilderness and the domestic, where territory is monopolized, where decisions are slightly fantastic ambience arises through the diligent actions of the ranger and her out-of-place urban uniform. The video’s soundtrack, composed by Nicholas Mallet, plays with a dramatic effect, contrasting with the clear golden sun of the forest morning.